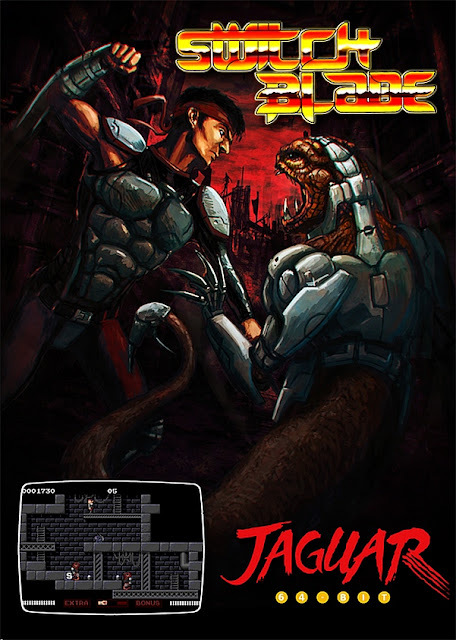 Indie Retro News: Switchblade (Jaguar) - Core designs Amiga platformer gets a Jaguar port! Switchblade (Jaguar) - Core designs Amiga platformer gets a Jaguar port! The best of both worlds for an early morning announcement, as Piko Interactive is now selling the Jaguar port of the 1989 Core Design and published by Gremlin Graphics Amiga platformer ' Switchblade ', with glorious cover Artwork by Simon Phipps original creator of Switchblade! This game which was also released for the Atari ST, ZX Spectrum, C64, Amstrad CPC and Amstrad GX4000 ,puts you in control of Hiro on a mission to recover the 16 pieces of the Fireblade, a sacred symbol of the ancient Switchblade clan. In Switchblade you'll be fighting through a flip-screen platform environment with a subterranean setting, as areas of the game become visible as you progress. You'll also be exploring both inside and outside, climbing ladders and picking up items and even finding bonus weapons. Although I did happen to play the Amstrad GX4000 version, which was an enhanced version of the Amstrad release, it's a nice game but don't expect one of the best ever releases on the Jaguar even if it's ported over from the Amiga. Pre-orders will be available 3-5 weeks before shipping starts. The game will be manufactured with all new parts and assembled by hand. Packaging will come factory sealed. Limited quantities will be manufactured and will not be any other runs.